European craftsmanship with attention to detail is the hallmark of our entire product line. We select from only the most respected manufacturers to bring you the highest quality products available anywhere. 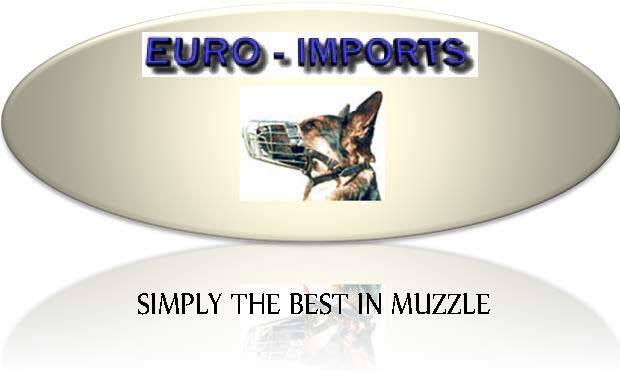 Including eight completely differently designed muzzles with three different sizes in each. This full range of design and styles cover dogs from Chihuahua to Great Dane and everything in between. A full line of Leads, Leashes and Collars made from premium leather. WHAT'S NEW!! Orders can be made also by fax or mail just follow the checkout feature. Shipping and Handling will be added to all orders. All invoices are due before shipment of orders. VISA , MASTERCARD and PayPal are accepted. All secure online purchases are administered by PayPal. For a full explanation of PayPal's terms and conditions please visit their web site at www.paypal.com. All products will be shipped within 3 business days except special and custom orders. All orders will be shipped Canada Post Expedited or UPS/Purolator Ground unless specified by buyer. Euro Imprts fully respects the privacy of every individual who visits our website. This privacy statement provides information on our data collection practices and of the ways in which the information may be used. Euro Imprts receives personal information from website visitors only when such information is provided voluntarily, such as when our visitors register a company, request information, provide purchasing information for our online store, or send us e-mail. When you provide personal information to Euro Imprts through our website, it will be used to fulfill your specific request. Euro Imprts may also use the information you provide to inform you about additional services and products offered by us. Euro Imprts will never release, sell, or trade your personal information to third parties unless you have authorized us, or we are legally required to do so. When you voluntarily offer any feedback, data, answers, questions, comments, suggestions, ideas or similar, Euro Imprts will treat that information as non-confidential and nonproprietary, and may utilize such information for informational, educational, or promotional purposes such as frequently asked questions lists or product/service testimonials. The Euro Imprts website collects some generic information automatically; this is statistical information only. The data gathered lets Euro Imprts know when and how much traffic a web page gets. Internet IP addresses are also logged for security purposes. This information does not include visitor identities or any personal data, and Euro Imprts will never combine this generic information with any personal information. When we take payment for your order we communicate with PayPal, our payment service provider. The PayPal payment system uses a combination of established and innovative techniques to ensure the security and integrity of all sensitive data. Their internet facing web servers are certified by Verisign, this ensures no third parties can impersonate PayPal to obtain secure information.